Will depart Genoa and travel by van towards Santa Margherita Ligure, located approximately one hour drive to the south. Here, you will embark on a motor launch for the 15 minute cruise to reach the harbor town of Portofino across the bay. Through the centuries Portofino functioned primarily as a fishing village and, occasionally, as a small naval port. Today it is a upscale resort-village. Portofino's miniscule bay is neatly packed with pricey yachts, common pleasure boats and, as a vestige of its past, some fishing boats. The water front is lined with multicolored pastel buildings, canopied outdoor cafes and a quay perfect for strolling. The surrounding hills host bougainvillea-garnished villas owned by the rich and famous. If you don't bring your camera to Portofino you will regret it. 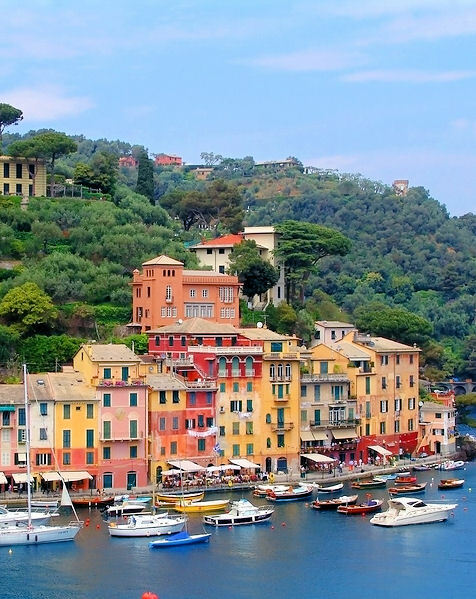 The town is striking with its brightly colored antique buildings hovering over sparkling blue water and the surrounding luxuriant green hillsides of the Portofino promontory are equally stunning. A very pleasant walk heads up to the right as you face the harbor: here you will find a very attractive walking path through one of the largest concentrations of flora and fauna in the Mediterranean. For some fantastic views of the entire bay and the Tigullian Gulf, you will walk up the hill to the Church of San Giorgio. Perched high above the town, this church contains relics of St. George brought over by crusaders from the Holy Land. You will then have some free time before boarding the boat to return to Santa Margherita Ligure. A beautiful old resort town favored by well-to-do Italians, Santa Margherita Ligure has everything a Riviera playground should have: plenty of palm trees and attractive hotels, cafes, and a marina packed with yachts. Some of the older buildings here are still decorated on the outside with the trompe l'oeil frescoes typical of this part of the Riviera. This is a pleasant, convenient base, which for many represents a perfect balance on the Italian Riviera: more spacious than the Cinque Terre; less glitzy than San Remo; more relaxing than Genoa and environs. After some free time spent in town, you will board the coach to return to the port of Genoa one hour away. Notes: Walking is over paved and cobblestone surfaces. In both towns there are inclines and/or steps required to reach some sites. In case of bad weather conditions, motor launches won't operate and the transfer between Santa Margherita and Portofino will be run by local bus. Be sure to bring your camera.